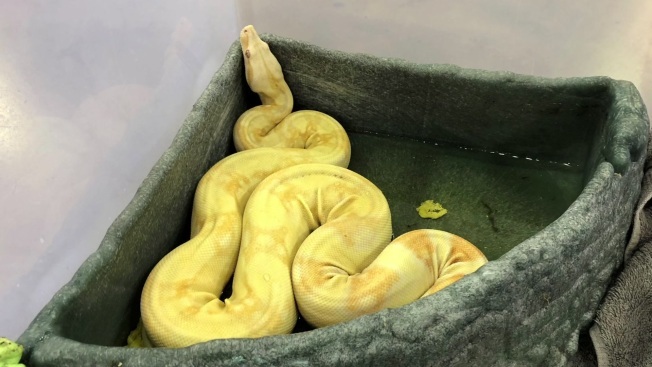 A shocking discovery Thursday at the Goodwill Industries of Fort Worth sorting center now officially tops the list of bizarre donations they have been forced to handle: an albino boa constrictor snake. The snake was very much real, and is now in the care of the Goodwill staff until its rightful owner can be located. The belief is that it did not slither its way into the southeast Fort Worth sorting center and was instead dropped off — either on purpose or by accident — at one of the 38 donation centers in the Fort Worth area. Thankfully for the snake — and for the other employees — Murphy has previous experience owning and handling snakes and other exotic animals, so he was prepared to help as opposed to panic when he got an urgent knock on his office door Thursday. A snake expert told NBC 5 that boa constrictors are not venomous and are generally fairly calm though they could bite when threatened. Editor's Note: The snake in this story was previously identified as a python. NBC 5 has since learned it is a boa. We regret the error.